***CyberCook Mini is now compatible with the new CyberQ Cloud(™) temperature control system. *** CyberCook Mini is the ultimate companion app for the CyberQ Wi-Fi (™) and CyberQ Cloud (™) BBQ pit temperature control systems. Remotely control and monitor all facets of pit operation right from your iPhone. Setup and connection are extremely easy in adhoc/hotspot or infrastructure mode. Sleep easy and worry-free while you’re pit smokes the BBQ you love. 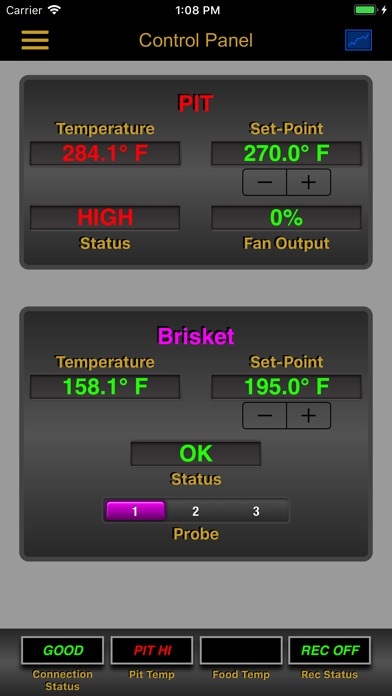 If any pit parameter exceeds your customized settings, CyberCook Mini will wake you up so you can make adjustments. CyberCook Mini is designed for both recreational and competition pitmasters. 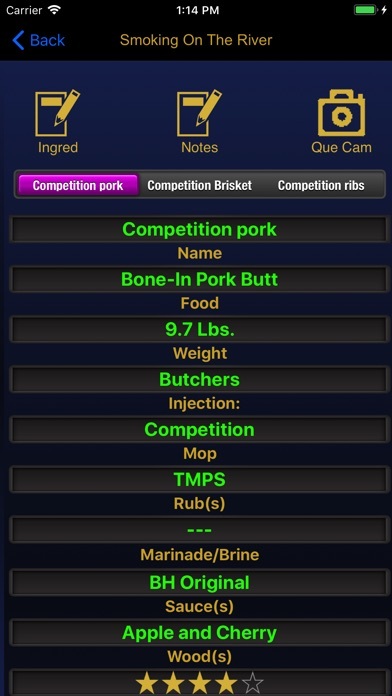 “The 2007 World BBQ Champion team Moonswiners used CyberCook for iPad extensively over the 2013/14 competition seasons and stated, “CyberCook is the ultimate companion app for the CyberQ Wi-Fi (™). We use it at every competition and can’t imagine competing without it." CyberCook Mini includes the following features: • Easy setup and connection in adhoc or infrastructure mode. • Customized for 3.5 inch, 4.0 inch, 4.7 inch and 5.5 inch screens and retina and non-retina displays • Optimized for iOS 11 • Remotely set and monitor pit and food temperatures. • Aural and visual alarms activate if pit temperature deviates from user-specified threshold and when each meat reaches the user-specified done temperature. • Aural and visual alarms activate if app loses connection to CyberQ device or in the event of a CyberQ power failure. • Enter custom names for each meat for easy identification. • Remotely set device settings such as ramp mode, alarm deviation, open lid detect, fan cycle time, proportional band, Wi-Fi settings, etc. • Customize app settings such as device refresh interval, recording interval and alarm inhibits. • Record your entire cook session for review both during and after the cook. 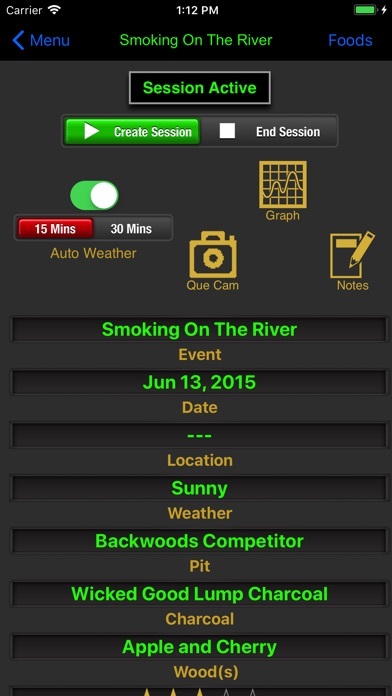 Parameters recorded include all temperatures and temp set-points as well as session meta-data such as event name, date, pit, charcoal, smoking woods and personal notes. • Graph pit and food temperatures and set-points for your entire cook session including detailed information about each plot-point. De-clutter the graph to display only the information you are currently interested in. 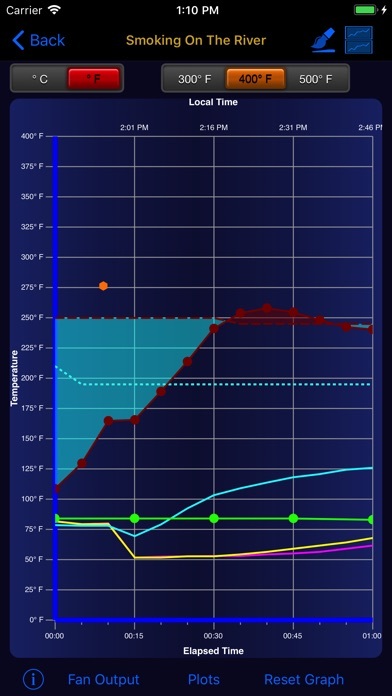 • Use the graph during your cook session to track pit history and make informed decisions on modifying your cook. • Email or print comprehensive cook session report that includes tabulated snapshot details and graphical depiction of entire cook session. • Four session management timers with customizable labels so you will never forget an important task again. • Detailed user guide available at iportablesolutions.com Check out the CyberCook Mini Features Guide and Users Guide available on our website. CyberCook has been extensively tested during both competition and home use and provides the ultimate in BBQ pit and cook session management. It’s easy setup and connection, intuitive interface and powerful features make it perfect for pitmasters of all skill levels. I couldn’t get this to connect to my CyberQ WIFI. It has no trouble connecting to other apps. Costly for it not to work. Save your money. Have used this app for a couple of years. The alarms are fantastic for waking me up to reload charcoal. Love it! Excellent app that works as advertised. I purchased both the iPad and iPhone versions and am loving every minute with them! The ability to log cooks, export plots, and save set profiles adds a vast amount of capability to the BBQ Guru unit. This app actually unleashes the potential of the unit that was hiding behind that simple web interface. There are also many novel little touches, like the ability to rename probe channels with just a touch, and domain name support instead of just an IP address. To the author: bravo; and I hope you continue contributing to the CyberCook apps for years to come! Will give 5 stars for push notifications and easier input functions. 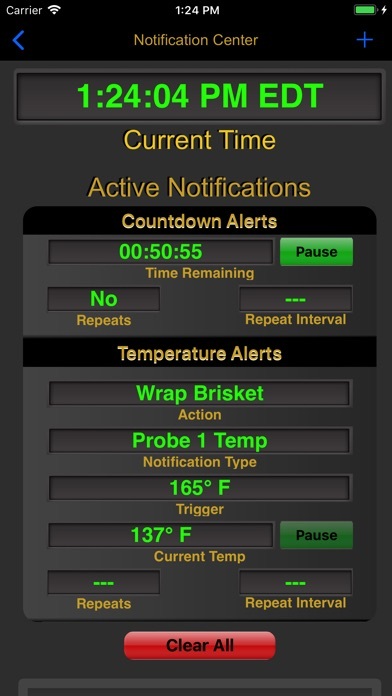 Love the app with CyberQ on my Big Green Egg XL. I like the time intervals and refresh rates for temp/fan details (better than Pit Pal's 2 minutes), the more advanced controls for alarm functionality and other aspects to help with repetitive alarms and/or unnecessary alarms while heating (not an option with Pit Pal). What I absolutely loathe, however, is the + and - signs to change temps and such. Please put a scroll function or other method to change these. The deal breaker for this app and reason I don't use it exclusively and am forced to use the Pit Pal in addition to this is because of the lack of push notifications. No, you must keep the app open and active, at all times in order to receive and is recommended your device be plugged in so it doesn't kill your battery. To me, this defeats the purpose of having the WiFi ability on a temp controller. In the manual for this app, the maker talks about how Apple won't allow it for whatever reason. This is unfortunate because every app on my phone, including this app's "competition," (The Pit Pal) has it. Fix this, the temperature input and create the ability to set multiple alarms for high/low cooker temp, as well as food temps. In the meantime, I will use this app for my information monitoring and rely on The Pit Pal and CyberQ for their alerts. Please, I beg of you, WE ALL beg of you to fix this issue. I purchased the Cybercook Mini app and put it to the test the same day. Easy setup and outstanding interface with alarms. Next version would love to see Push notifications for the times when I'm cooking and using my phone for browsing the Internet. Alarms work great when in foreground, but a background notification would be great. Love it!!! I purchased this app once I realized how basic the CyberQ website is for monitoring a cook. The app has nice graphics and control everything on the CyberQ. It would be nice if you could see all temps on one screen so you wouldn't have to scroll through 4 screens. I would give this app more than 5 stars if it could handle the IP address limitations of the CyberQ. Oh and how about push notifications? The horn is annoying.